This is the third makeover of this recipe that I've done and it may be my favorite yet! With Fall right around the corner, I have been hankering for anything "Fall spiced", which includes all things apple, pumpkin, and more! 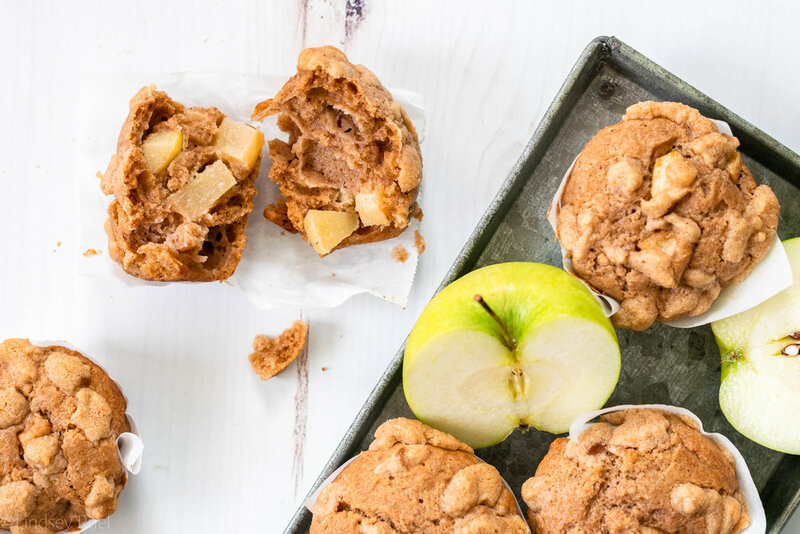 These apple muffins certainly check off that box with the sweet and tart apples mixed with the cinnamon-y spice of apple pie spice. They certainly are getting me in the mood for Fall! 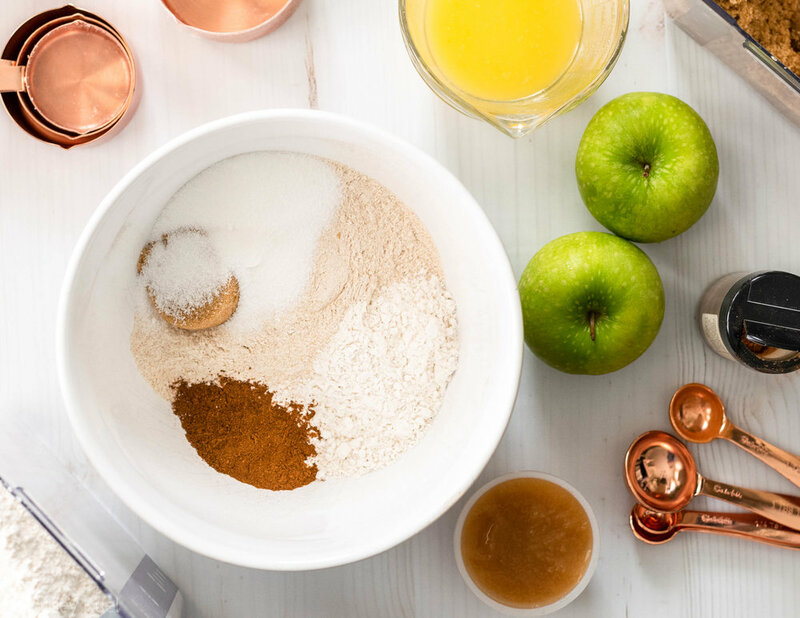 First, mix together the dry ingredients: flours, sugar, baking powder, baking soda, salt, and spices. Then combine most of the wet ingredients. I like to whisk the milk (make sure it's warm), butter, sour cream, applesauce, and vanilla together first so that it forms a smooth slurry. If your butter starts to harden because the other ingredients are too cold, pop it in the microwave for 20 seconds or so until you can whisk it smooth. Pour the wet ingredients into the dry and now add the egg. 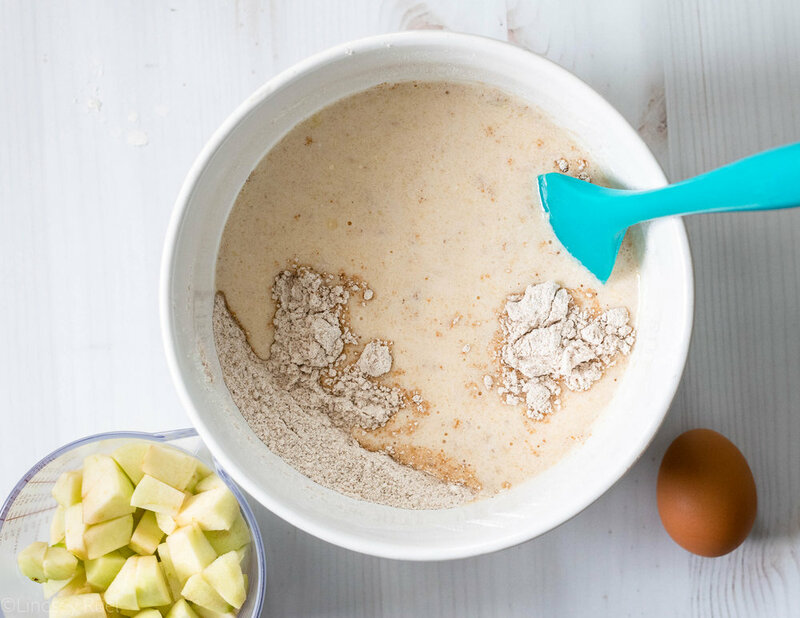 Mix until the batter until it is just combined. 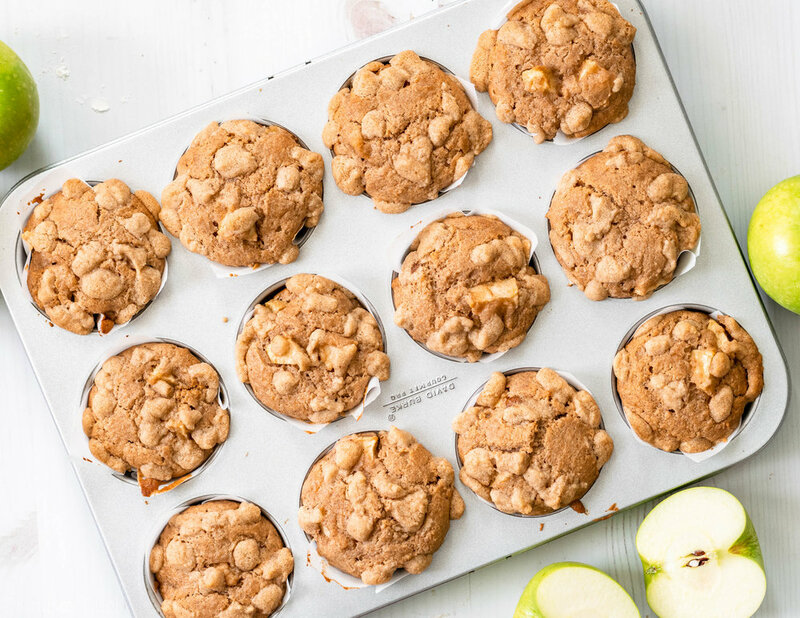 Fold in the chopped up apples then portion the batter into the muffin pan. I like to use my ice cream scoop for this because it seems to make the perfect sized muffin! Bake the muffins at 350 degrees for 20-25 minutes, or until they are nice and brown on top and a toothpick comes out clean. Definitely let them cool for about 10 minutes before trying to eat. The apples inside will be steaming hot if you dive into them too early! After that, have at them! 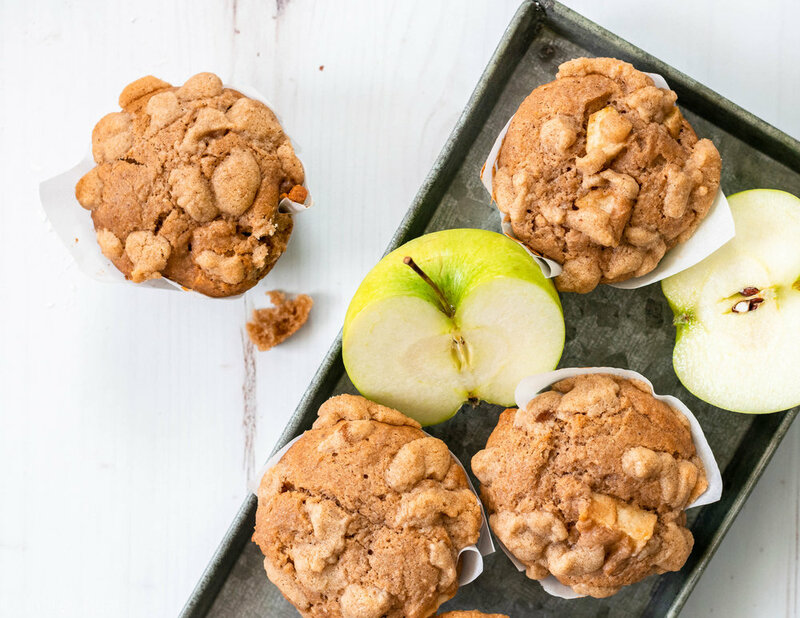 They are a wonderfully delicious breakfast treat any time of year, but especially now as we head into apple season! 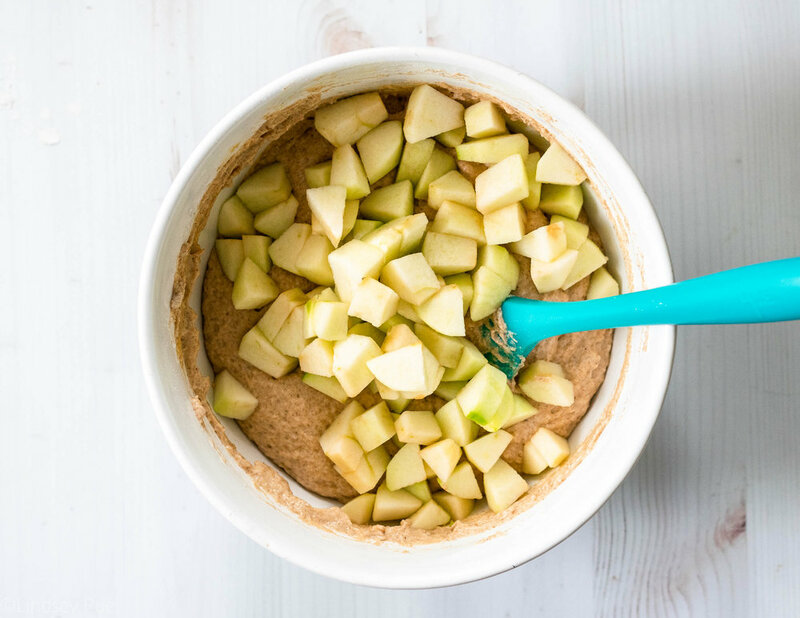 This is a great recipe to have under your belt if you plan on going apple picking this year! In a large bowl, combine flours, sugars, spices, baking powder, baking soda, and salt. Whisk until there are no more lumps. In a small bowl or measuring cup, combine butter, applesauce, sour cream, milk, and vanilla. Whisk until smooth. Pour wet ingredients into the bowl with dry ingredients. Add in the egg and mix until all ingredients are combined. 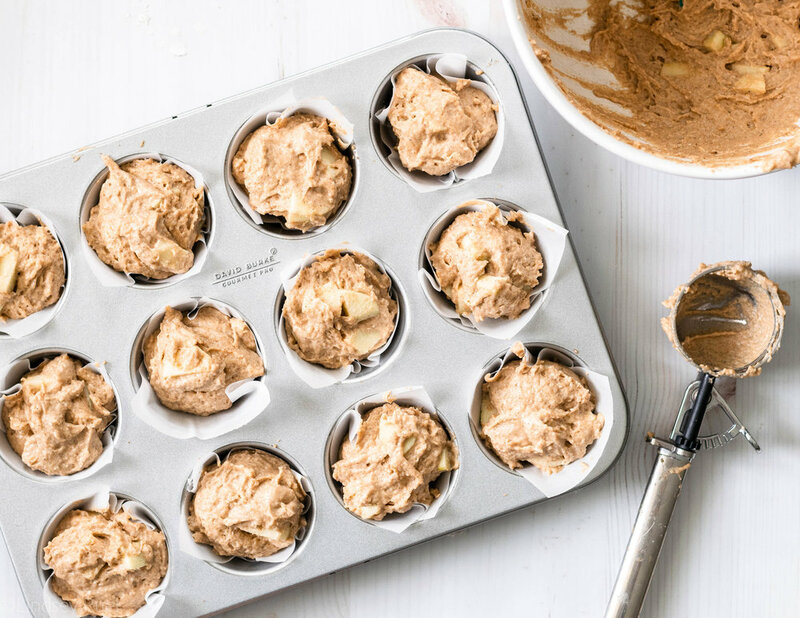 Scoop approximately 1/4-1/3 cup of the batter into each muffin tin cavity. Bake at 350 degrees for 20-25 minutes until the tops are brown and a toothpick inserted into the center comes out clean.